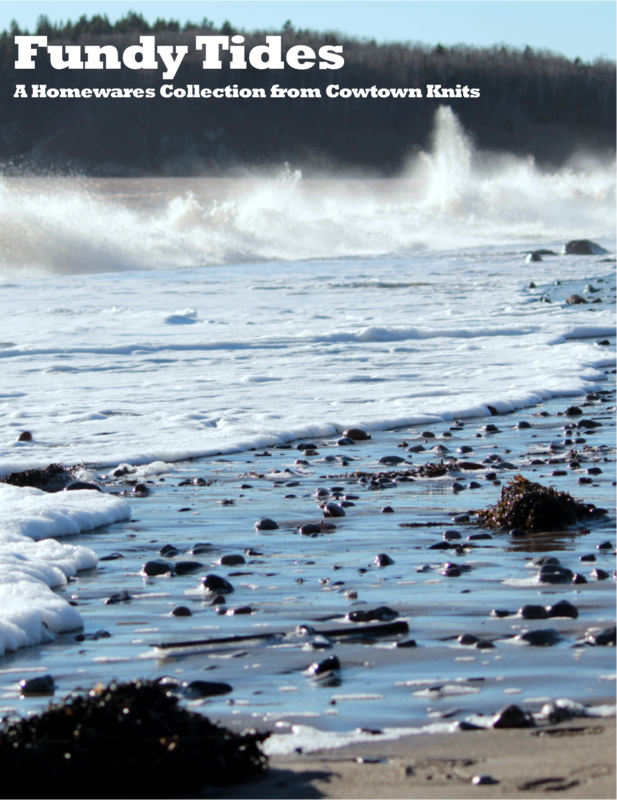 Along with the release of Ribbon Weed, I’ve also published the first installment of the Fundy Tides Collection. This collection features cable patterns that remind me of the shapes of the sea weeds and you’ll find variations of them on each of the pieces. 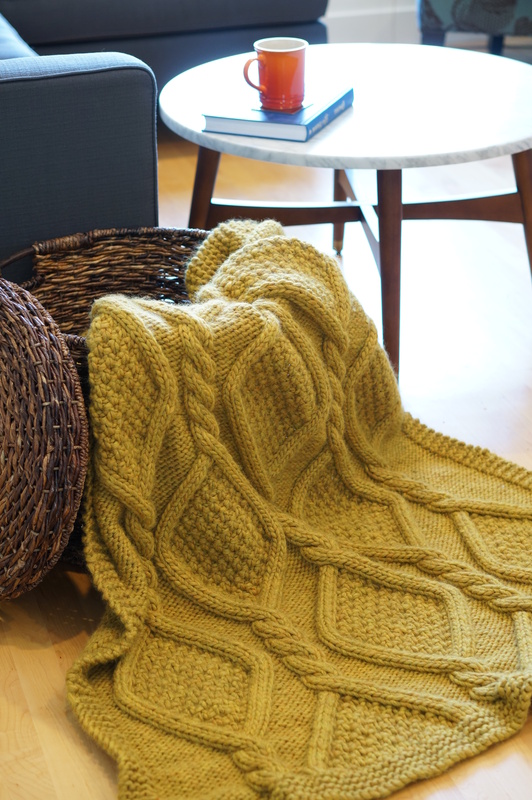 The Ribbon Weed throw has large cables knit in super-bulky yarn for a dramatic effect. The cables on the Sea Oak pillow are more understated, while the Dulse pillow is a celebration of cables. All of these patterns will be available individually or together as part of an e-book. The patterns will be priced at $5 USD each. The e-book will ultimately be priced at $10.50 USD, a savings of $4.50 over buying the patterns individually. But the book will be available at a lower price while it is not yet full. Each time a pattern is added, the price will go up. The introductory price, available when it only contains the throw pattern, will be $6. Once the 2nd pattern is added, the price will go up to $8. When the final pattern is added the price will be the full $10.50. Each time a new pattern is released, the e-book will be updated with the new pattern. Customers who have already purchased the book will receive an email notifying them that the book has been updated. So, my advice is to get it while it’s hot! Click the Buy Now button below while the book is available for the lowest price. Not only have I chosen my favourite set of names from the naming contest, I’m ready to announce the publication of the first pattern from the collection. 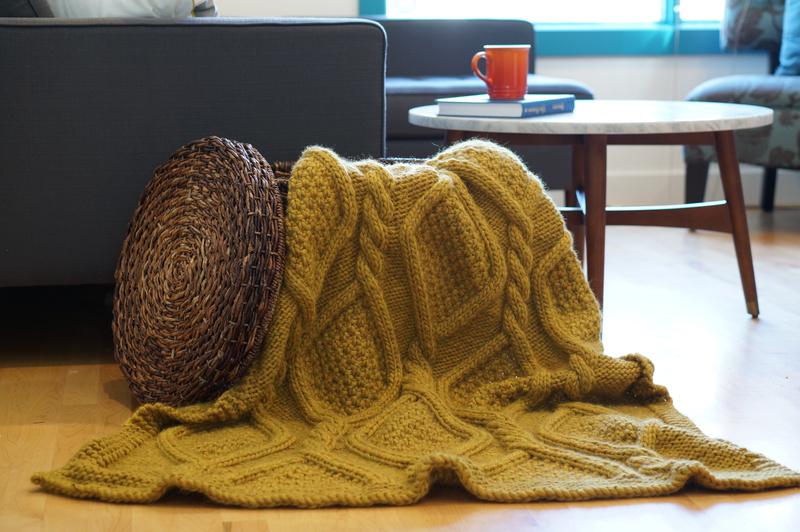 Without further ado, let me introduce you to Ribbon Weed, a super-bulky cabled throw. 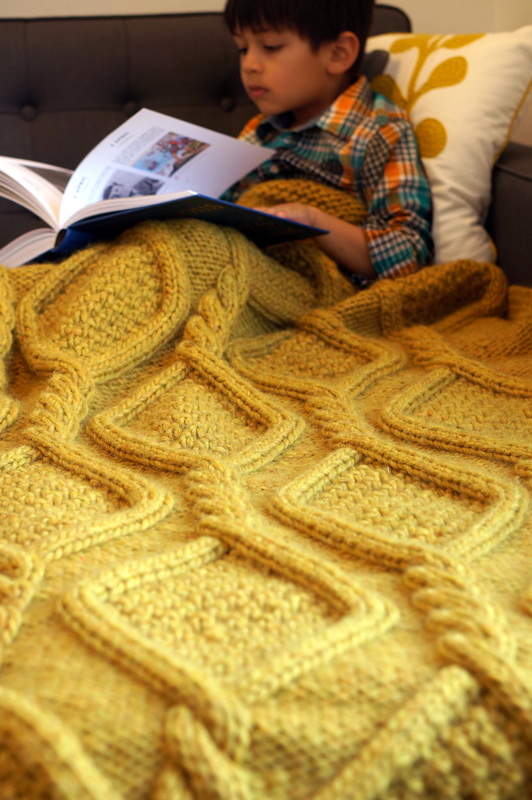 You will be able to whip up this cabled throw in no time! The Cascade Magnum produces a luxurious and stylish fabric that is super cozy to snuggle under. The throw features large double-seed-stitch-filled cables nestled in reverse stockinette stitch and a garter stitch border. The pattern is available for purchase individually or as part of the Fundy Tides Collection, which will also include two pillow patterns. You can find more information about the collection here. Once again, thanks go out to Eleanor Dixon for technical editing. And this time a huge thank you goes out to my mom, Pat Bostwick, for test knitting, proof reading, and coming up with the great names for the collection. I am excited to let you all know that I’m going to be releasing a new pattern soon! It will be the first in a three-pattern collection centered around a cable motif. 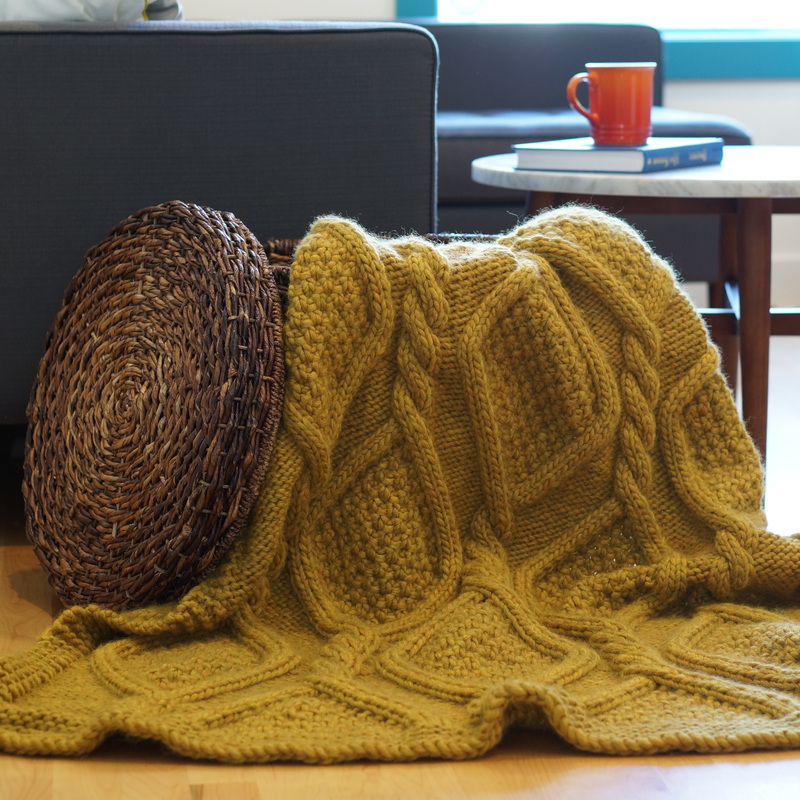 The first pattern will be for a throw that’s worked up in gorgeous super-bulky Cascade Magnum. The other two will be pillow covers made with Cascade 220 Superwash. I’m so thrilled with how the first sample came out and am excited to be working on the others. Here’s my problem: I have absolutely no idea what to name the patterns or the collection. I sat in front of the computer last night for an hour and still came up with nothing but ridiculousness. Seriously, I had convinced myself to name the collection Charles Cable III – with the throw being called Chuck and the pillows Chaz and Charlie. I really need some help. Here’s my solution: I’m going get someone else to do the naming. Here’s what you need to do: If you’re a Ravelry member, head on over to the contest thread, read the details, respond to the post with your awesome suggestions. If you’re not a Ravelry member and would like to participate, you can do so by responding to this post. Here’s what I’m looking for: 4 names – one for the whole collection, one for the throw, one each for the pillow covers. Here’s what you’ll get: I’ll be picking 2 winners – 1 for the best set of names, 1 randomly chosen from all the entries. Both winners will receive the entire collection when it is released. The colourway for the throw is called Birch, and the colourway for the pillows is called Pacific. So hit me with your best suggestions! Can’t wait to see what you all come up with!